Hard to argue with over four decades of truck know-how. The Ford F-150 is already the best-selling pickup truck in America. Has been for 41 years. But how does it rank among America’s active and retired military service members? An analysis done by using the United Services Automobile Association’s car buying service reveals the F-150 is also their preferred truck choice. USAA, a financial services group, further added the F-150 was the number one purchase choice for all branches of the US military in 2017. “We are proud and humbled that those who protect and defend our country choose Ford F-Series,” said Todd Eckert, Ford truck group marketing manager. “F-150’s high-strength, military-grade, aluminum-alloy body is designed to serve customers who are used to performing in the harshest of environments and who rely on the capability, durability, and functionality delivered consistently by Built Ford Tough.” For 2018, the F-150 received a number of upgrades inside and out. For example, there's the . Because the F-150 is offered with several engine options, body styles and countless other features, it’s possible for buyers to build themselves their ideal truck. America’s military heroes are clearly fully aware of that. The updated F-150 has also received a few other prestigious awards recently, such as the 2018 Truck of Texas and the 2018 Motor Trend Truck of the Year. It also earned the Kelly Blue Book Best Buy Award for the fourth straight year. 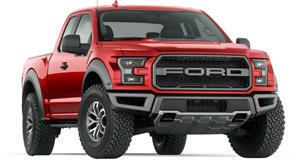 Despite all of that, the F-150 has some brand new competition from its two most serious rivals, the and . Both have just been completely redesigned and were shown at Detroit earlier this month. While the current generation F-150 has only hit the mid-way mark in its lifecycle, it’ll be very interesting to see a three-way comparison test covering all necessary ground.